There are four bathrooms, a carport, laundry room and trails to walk for 17 acres. The historic neighborhood, San Sebastian was started as an artists colony by Fremont Ellis in the 1930s. There are many well known artists in the area. 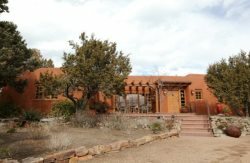 The house sits on the side of a mountain and is surrounded a pinon forest.